I’ve never been one to worry about where a film gathers its inspiration; I’m more concerned about the overall quality of the product. John Carpenter’s Halloween set the slasher world on fire in 1978 and has been criticized over the years from heavily borrowing from the earlier work of Bob Clark in his 1974 Canadian epic, Black Christmas. They’re both great movies, and that’s all I need to know. Besides, if I confined all my props to Bob Clark, I’d be forgetting a little film released before the flagship Maple Leaf slasher called Silent Night, Bloody Night. You can pull out your Black Christmas checklist right now and gander at the attributes and check off plenty that Silent Night, Bloody Night also contains. If you can believe it, Silent Night, Bloody Night actually has seen more DVD releases than Clark’s movie, but the con is they’re all public domain shoddy releases. The bright side? The average price paid for the film is well under a dollar. Is it a worthy stocking stuffer, or should this one be promptly roasted on an open fire? Silent Night, Bloody Night is actually an engaging, cheap slasher that proved to be slightly ahead of its time. No one goes in expecting too much from public domain cheapies, but often enough you’ll get one that surprises you, and that’s precisely what happens here. The similarities to Black Christmas are definitely there, from the snarly phone calls, Christmas setting, POV shots to general slasher mayhem. The two would actually make quite the double feature of season’s slayings. Just when you think things can’t get any better, you see Mr. Cameo himself, John Carradine’s name in the credits and nostalgic cheapie fans can’t help but grin. From start to finish, the flick grasps the viewer by the throat and doesn’t let go. At one point during the climax, things get a little far fetched, but that is something easily overlooked in a film of this nature. The strongest element the film has going for it is the fact that it was made before the slasher boom hit and therefore doesn’t exist entirely within the rules that became standard. 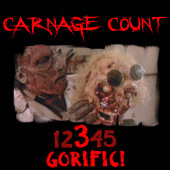 Revenge is a key motive in the film, but unlike Prom Night and countless other slashers, the theme of vengeance isn’t used as merely a motive to put the knife in a killer’s hand to cut up cuties. Instead, the mystery unravels with the characters and viewer both not knowing what comes next, adding extra oomph to the occasional severed hand and a sensational axe massacre by the black-gloved madman. Between guessing who the killer could be, plot twists and the slow revelations of the backstory, there’s little time to sit around bored. All the while, presents are wrapped, Christmas trees blink and the film’s score plays on that eternal classic, Silent Night. From a directorial standpoint, there are many wonderful establishing shots of the mansion and the lighting is dim and eerie throughout. Depth plays a nice role in the film as cold, leafless trees are abundant, the shadows of the old house shrouding the mysteries along with a creepy graveyard making sure to keep the film relatively high in atmosphere. And, what would be a slasher without a few good red herrings? The acting is sometimes a tad stiff and the dialogue is nothing to brag about, yet it still pleasantly keeps its head well above water for the short 81-minute runtime. One of the more enjoyable moments of the film is a sepia-toned flashback scene involving mental patients getting loose and going on a rampage in the asylum, seeking revenge on the doctors that kept them locked up. The picture quality gets a bit rougher during this scene, which helps it become even more tense and unnerving. The disc I viewed is from Brentwood Entertainment, the first true king of the DVD value pack, from their Vault of Horror 10 movie collection. The video is what you’d expect, old school full frame VHS-style charm with some incredibly dark scenes, blemishes and a yellow vertical line running down the screen for a moment here and a longer moment there. The audio on the other hand is surprisingly clear, free of hiss other than the very odd cackle. 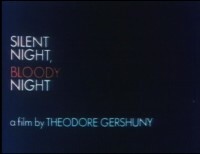 Is Silent Night, Bloody Night going to take away from the thunder of tried and true classics like Black Christmas and Silent Night, Deadly Night? Probably not, especially for the former, but in my mind, it’s the perfect Christmas themed slasher that is probably already in many collections just waiting to be discovered. If it turns up in your stalking, don’t hesitate to give it a spin. Buy it!